First, let's be clear: this post is for portrait photographers who, like me, strive to capture some kind of honest slice of what it might be like to be a human being. Editorial photographers or commercial photographers--who seek to capture clothes or other products in enticing/alluring ways--they might not be as interested in what I'm going to write about here. First: Prioritize light. Of course, we've all heard photographers say that light is so important, and it is. It can underscore the truth you want to tell about your subject(s). It is probably the most important adjective in the sentence of the photograph you're trying to create (does that make sense?). It can be happy, ominous, calming. That said, keep an open mind about light. Often times, the light in a given room at a given time of day is honest to the experience of the person in that room. In other words, wouldn't it look funny to take a portrait of a dad reading a story to his son before bed if the light was bright? It might look surreal, or just commercial, and not honest to the subjects. Although, it's true, using odd lighting can add to the message you want to portray, so just, well, know what you want to say, and match the light to that. Second: Prioritize the EXPERIENCE OF THE PHOTO SESSION and tailor it to your subjects. That is, do something natural/fun/engaging with your subjects in order to do what I call, "zoning" your subjects. Zoning your subjects just means that you're attempting to get them in the zone of being themselves, of laughing that funny laugh they have, of engaging with their kids in ways they would engage their kids when no one's looking, whatever. In order to zone your subjects, you have to be confident. I once had a very fine photographer shoot my portrait, and he mentioned that the degree to which you yourself are comfortable in front of the camera is the degree to which you'll make your subjects feel comfortable in front of the camera. I think this is true. I often zone my subjects by talking to them while I shoot and, sometimes, moving quickly from one set-up to the next. Third: Composition, composition, composition. Know the rule of thirds, and use it almost all the time. Break the rule with flare, skill, and--darn it--throw away any photographs that don't do either one of those things. There is no exception here. One little thing: This rule does not wholly address what some might call your "artistic or photographic eye," or the way you see the world, how your hand-eye coordination combines with what you see and where you stand to snap a portrait. Your EYE is, in my opinion, somewhat innate and fairly elusive. Hopefully, you became a photographer because you already had a hunch that your eye was a good one. I do believe that you can improve your eye, but only to an extent. How do you improve your photographic eye? Um, IDK. Shoot a lot, shoot in different ways, challenge yourself. Try weird light, different subjects, move around when you shoot, just mix it up. Fourth: forget about props. If you're relying on props to create an interesting or pretty image, your image will eventually date you. Just like shoes and hairstyles go out of fashion, so will your choice in props. I try to use as few props as possible. I want my images to be classic, to withstand the test of time. Plus, relying on props to portray some kind of truth about your subjects is a bit odd. I mean, how much DOES a newborn's headband say about babies or what it's like to be a baby? Go ahead and reference Anne Geddess on this one, folks...even she's talked down about her initial over-propping in her documentary New Beginnings. Irwin Greenberg said it well, "Don't look for gimmicks to give your work style. You might be stuck with them for life. Or, worse yet, you might have to change your 'style' every few years." *The caveat: if you have the time or inclination, and you've prioritized the most important things, go ahead and throw in a well-placed prop or two, but do so intentionally and with a mind to the subject's personality. Also, if you are a surrealist/fine art portrait photographer, completely forget what I just said. Fifth: Forget about fancy equipment. This seems counter-intuitive, as most of us professional photographers are equipment freaks, but it's true. Go ahead and look on Instagram, or just do a general search for iPhoneography, and tell me I'm wrong about how you can take amazing images with any camera. As long as it's not a broken camera, of course, and--more importantly--as long as you're using it correctly. *The caveat: If you have the money and forethought, and you've prioritized the most important things already, go ahead and get the right tool for what you want to shoot/say. That DOES help. But again, if you want to take an honest portrait of a person, you sure as heck don't need some particular camera to do it. Last: Forget about editing. If you're relying on how you edit a photograph to make that photograph special, that's called a gimmick, and you might not be paying enough attention to the first 3 priorities listed above: light, subject, and composition. What's more: editing trends come and go like fashion trends, and this will FOR SURE date you like a pleated backdrop, baby. You might not believe that the matte-effect PSP action you've been hot on will someday be, like, as noticeably uncool as mall bangs, but, if you overuse it, oh, it WILL. Just, take a good picture first, and then add a little something-something is PSP or Lightroom, just a little. *The caveat: If you are a Photoshop genuis, some kind of fine art editing extraordinaire, and extreme editing is part of what you're trying to say as an artist, completely forget what I just said. So, this is my little cheat sheet for good portraits of people--for what I call "good" portraits, anyway. Your definition of "good" might be different from mine, and you might not be interested in truth or honesty (that's another blog post altogether now, isn't it?). And, I mean, REALLY have a vision, people. Surf the net, learn about other photographers. Know what's happening in your field at all times. Think about who you are as a person. Take the time to write an artist's statement or something. Be intentional. Your work will be so improved for it, just as a business is so improved by the owner who takes enough time to write a business plan. And, once you have a vision, don't compromise. Stick to it, and don't show off other stuff on FB or wherever that isn't "you." That stuff is watered down, and it will only slow your improvement as an artist and business person. And, I mean, REALLY know your equipment. Read your manual, duh, like, twice. Three times. How many is too many? Try different things, new settings. Learn how other people use your equipment, and keep learning it because man, does it ever change. I'm sure I'm leaving something out. This is quick and dirty, people. This is someone schooled for years in English literature and creative writing, here :). This is what I've learned in the past 2.5 years of shooting lots of people in lots of situations and always wanting that honest/beautiful portrait, though. I'm sure my list of photographic priorities will change but, for now, this is it. I know I don't live up to all of these standards all of the time but, man, I sure do try. I'm ending now with two photographs, because that seems most appropriate. I chose these photographs because this guy was in his zone being himself, so comfortable in front of the camera. I could tell he loved his dog, can see something genuine in his eyes. Love his bare feet and scruffy-cool hair--that's how he was when I walked in the house...and that's how I wanted him to be seen. 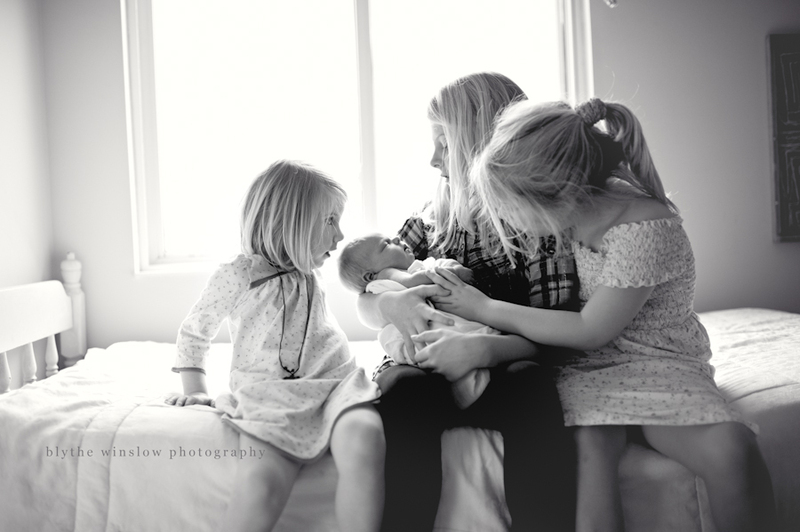 Little Charlotte came home to three bright-haired sisters and a loving mama and dad. 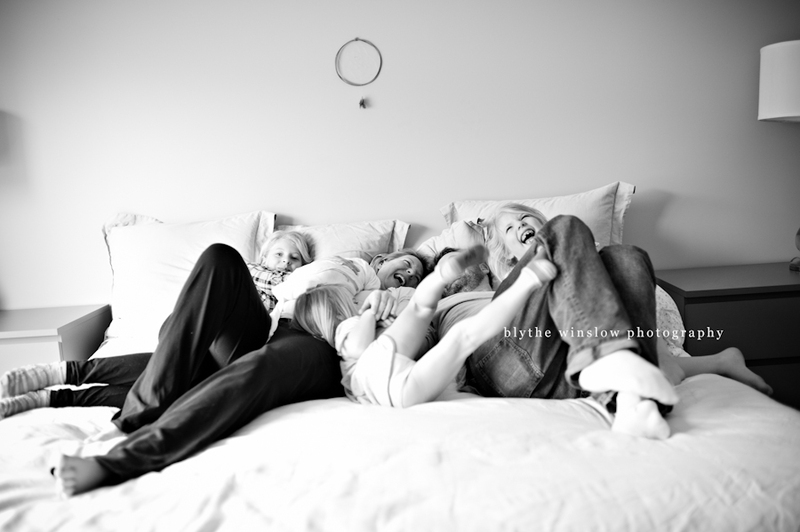 The house was hushed and excited all at once, and I was so lucky to be there to capture it all. Can you feel the hush and flutter? Sometimes it happens that a little dear newborn doesn't want to sleep for his/her session, which isn't always ideal for us newborn photographers. What happens, then? Well, if little babe is awake and doesn't want to be posed into the pretzel-like poses I have all ready and planned, then we just wrap the kid up and let Mom hold her. Aw. That's better, now, isn't it? I love newborn shoots, no matter what happens or how the babe comes to be comfortable. And she looks pretty comfy, right? Just thought I'd share this little sweet dear's face from my recent workshop with Laura Brett. I also want to write a line or two about the holiday balancing act around our house, which seems to get more intricate as the years go by. I mean...we have things to think about around here--like Santa, etc. You see, our little India Jane has just turned 2. As she grows older, we're just making things up along the way, of course, about who we want to be as parents (and as a family). I'll tell you what. This holiday season, we're proving to be a busy family. We're a last-minute-online-shopping kind of family, a maybe-we'll-make-Christmas-cookies-maybe-we-won't kind of family. We're proving to be overwhelmed around the edges, and you might even find our noses runny. We can't remember what present we wanted to get so-and-so, and we dread braving the malls. But, we're also a sing-Christmas-carols-in-the-car kind of family, and we enjoy the simple things: a house dressed in lights, the smell of coffee and pine needles, or even the odd satisfaction of a present wrapped crisp and tight. So, from my family to yours: Happy Holidays, and cheers to the beautiful and overwhelming balancing act that the holidays bring. Just got home yesterday afternoon from Laura Brett's Baby Business workshop, where, over the course of two days, a lucky handful of photographers and I were charmed and amazed at the talented, twang-talkin' machine that is Laura Brett. 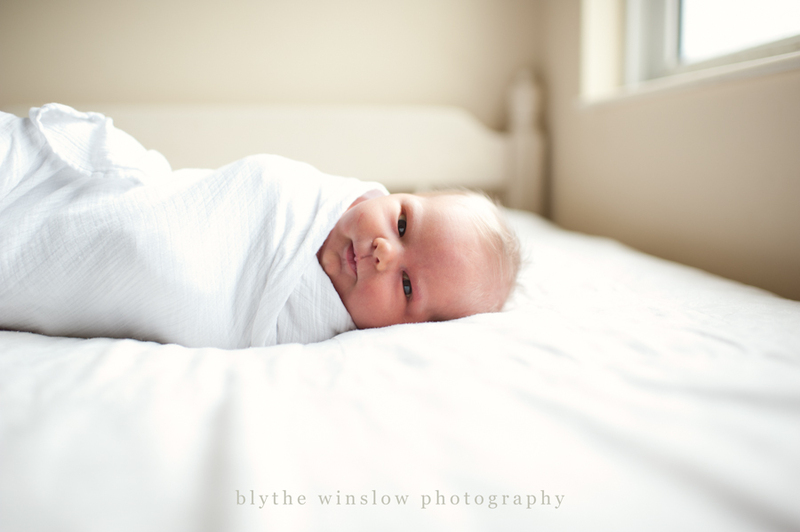 My next workshop wish: Pinkle Toes Photography's lifestyle workshop--I love lifestyle newborn photography, and, of course, I'm always trying to up my game.